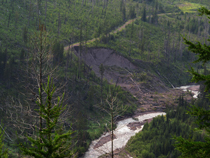 Greenwire reports Forest Service Chief Tom Tidwell told a U.S. House Subcommittee hearing on the matter Thursday that only 5% of Forest Service timber sales were taken to court this year, while 16% of the timber sales failed because the timber industry simply refused to buy them! 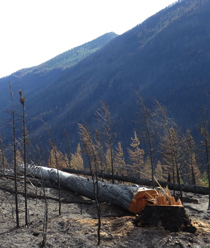 And an abundance of research shows the importance of not trying to replace or follow fire with logging: "There is substantially less high-intensity fire now than there was historically, prior to fire suppression policies, and this post-fire habitat deficit is worsened by extensive post-fire clearcutting on national forests and private lands, and by landscape-level mechanical 'thinning' designed to further suppress fire, making snag forest habitat the most endangered forest habitat type in the U.S."
We need your help stopping the perverse waste of your tax dollars trying to replace ecologically beneficial backcountry forest fires with subsidized, ecologically destructive logging! Click here to Donate Now and your contribution to our work will be doubled by Cinnabar Foundation!